“What if mobile, self-sufficient living units were the building blocks for future cities?” asked New York artist Mary Mattingly. 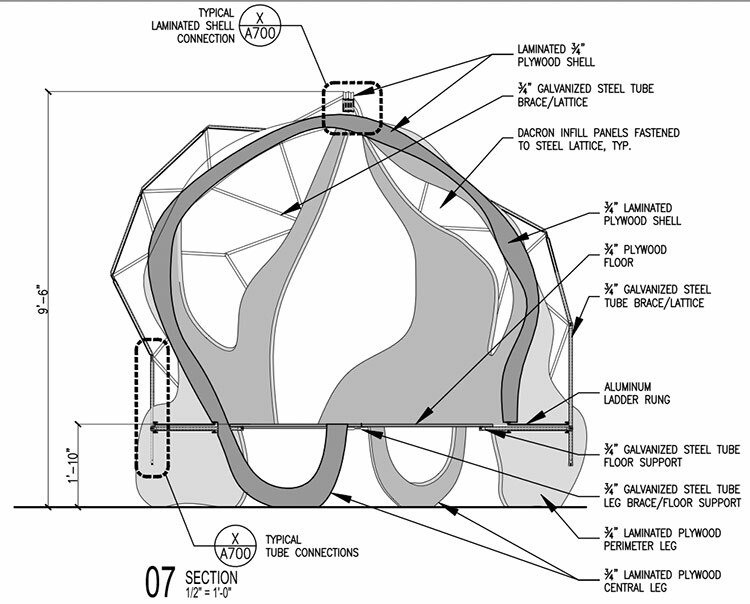 She explored this question in her Flock House Project, experimenting with migratory living solutions through fantastical inhabitable installation art. The project is going on throughout the city this summer. 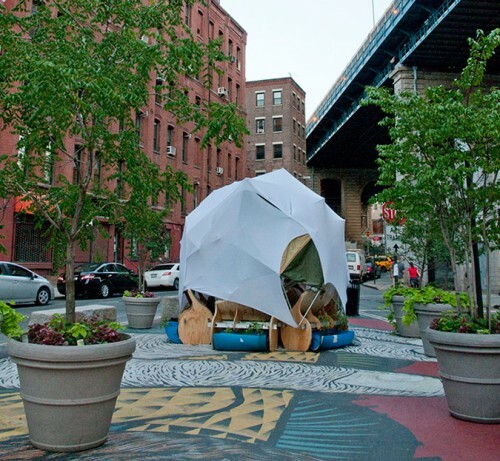 Mattingly’s series of four “Houses” have been traveling around the five boroughs since June. 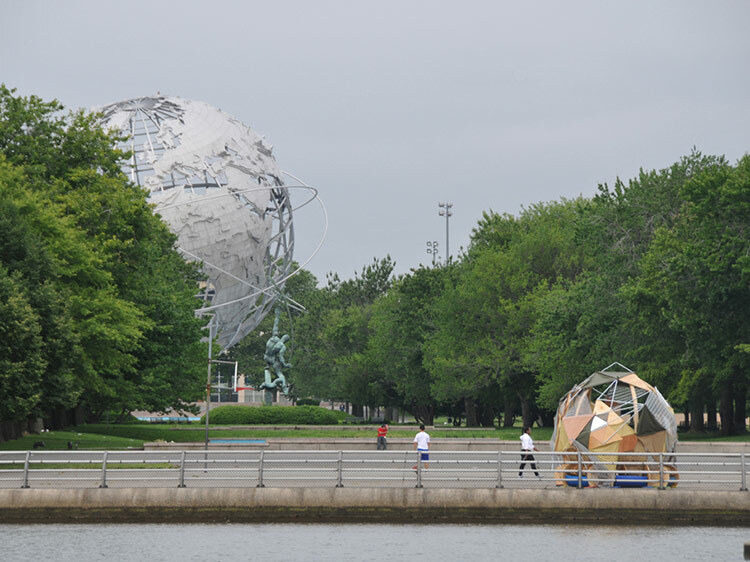 Individually titled the Microsphere, Terrapod, Chromasphere, and Cacoon, they are now on display at the Bronx Museum, Snug Harbor, the Maiden Lane Exhibition Space, and Omi Sculpture Park in Ghent, NY. In response to an era of increasing environmental, political, and economic instability in which one seventh of the world’s population—that’s one billion people—is continuously “on the move,” the Flock Houses offer a new mobile framework through which urban dwellers can experience these issues. 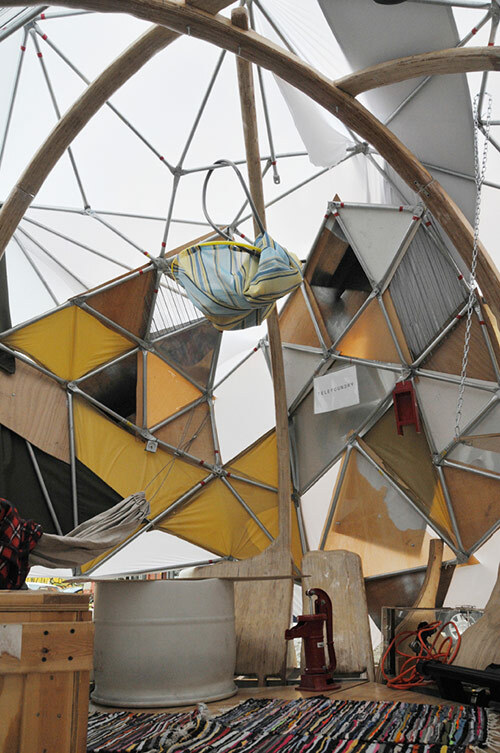 These small structures provide minimal amenities for the artists who have chosen to inhabit them for two-week spans, emphasizing an alternate system for urban flexibility and decentralization. Up to two participants sleep in hammocks, while a combination of solar and bicycle power, along with levers and cranks, power the dwellings. Container gardening is utilized to demonstrate the possibilities of ultra-small-scale self-sufficiency, and water is collected from rain run-off. The structures were built collaboratively through a “gift culture,” using reclaimed materials and construction site leftovers. They are also modular, and can be snapped together to from a flock, or tagged onto the side of an existing structure to feed of of its utilities. Together, these methods reflect the combination of autonomy and community interdependence that is at the heart of the Flock House Project. The project offers workshops, events, and narrated cell phone tours. To find out more about visiting the Flock Houses, check out their website.